Per fess Or and Gules, in chief a demi eagle displayed naisant sable, in base three diamonds Argent, cross couped shaped. For a crest out of a ducal coronet a demi eagle as in the shield. A shield divided into four parts, on the upper right side two bars, on the upper left side a half eagle, under it, three roses; on the lower left the same eagle, on the lower right a repeat of the two bars. On the helmet within the crown is an eagle, without legs or tail, above the head of which are two crossed axes. The Manuscript of Prussian Families. This coat of arms was called Slomff according to The Manuscript of Prussian Families, and according to it was brought to Poland from Germany in 935 from the famed family of the Counts of Solms, the Rulers of Braunfels, Mintzenberg and Sonnenwald. After the death of Duke Bołesław Swidnicki 1), Johann III Romka, Bishop of Wroclaw, was appointed guardian of his two minor sons, Henry V 2), Duke of Wroclaw, and the Duke of Legnica, "on account of his diligence and honesty of character." However, he was very lavish, and he wasted a great deal of the children's inheritance, taking from it sixty thousand grzywna, for which he later had accounting problems with the princes and with the previous lords. He occupied this see [Wroclaw] from 1292 to 1302. Some members of this house signed their names as "z Pleszowa" [from Pleszow]. One of them was Ibram z Pleszowa, in 1398 castellan of Zawichost, where he placed his signature on a letter given by King Jagiello to the city of Lublin. There was also Stanislaw z Pleszowa Sulimczyk, who among others hung his banners in Buda in 1443. Zawisza the Black [so-called because of his black armor], a man of great qualities, traveled in the legation from King Wladyslaw Jagiello to Emperor Sigismund in regard to the king's marriage to Agacya, widow of Václav II 3), King of Bohemia, when the Taborites defeated Sigismund so badly that he had to flee from them; Zawisza was taken prisoner and was freed in 1424. He entertained liberally on Friday the great monarchs assembled in Krakow for Queen Jadwiga's coronation and was lavish in his gift-giving. In 1428 Zawisza was leading forces of the army of that same Emperor Sigismund - but by this time he was the starosta of Spisz - when Sigismund, struck by fear of the Turks' swords, crossed with the larger part of his army to the other side of the Danube; due to the scarcity of ferries and boats he left the second, smaller part to be massacred by the pagans. Sigismund, regarding highly Zawisza's merits, sent a boat for him, ordering him to save himself. But Zawisza, a man avid for knightly glory, regarding it as an unworthy deed to leave his post or abandon his cavalry, thanked Sigismund for his favor but chose to die heroically at his position rather than diminish his glory by fleeing from the foe. Having mounted his horse and taken his lance in hand, with only two foot soldiers he went forth against the Turks and fought valiantly against them, but was surrounded by a large number and captured. The inhabitants of Raška buried his body. Dlugosz's Epitaphs also includes a verse written for Zawisza by Adam Swinka, Krakow canon, for this Zawisza was married to Barbara, the niece of Piotr Wisz, Krakow bishop, and she grieved so for his loss that she came to die, leaving two sons by him, Marcin and Stanislaw from Roznow, who died with King Wladyslaw at Varna. That is what Dlugosz and Kromer say, but Leunclavius in Turkish Chronicles, calls one of them Michal and writes that he fought valiantly in the battle of Varna in 1444. "The King of Hungary fought on one side, on the other Michael known as the Black [i. e., "Czarny"], they attacked Murad's forces with such strength that they compelled the foe to flee." "Barbara of Rożnów the granddaughter of a godson Zawisza the Black the most illustrious soldier in the Christian world the wife of Joannes of Tarnow the Castellan of Krakow. Lived 70 years. Died in 1517." 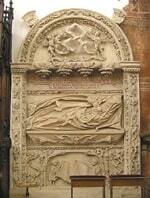 says her gravestone in Tarnow; her son Jan Tarnowski was a Hetman Vialiki Karonny (1527-1561). 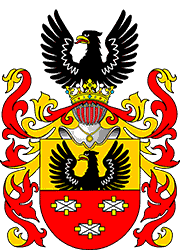 Some family members of this clan took the name of Sulima from the arms, of whom several flourished in Podolia, where the last heir left her manor in Kamieniec Podolski under the name of "St. Michael's" to the Sisters of St. Dominik. Anna married Chodorowski. Other Sulimas settled in Sandomierz District, of whom Jerzy Sulima Czarny signed to the election of Wladyslaw IV. Dlugosz says in his History that after the death of Boryslaw, Archbishop of Gniezno, in 1306, as his successor to this office the pope appointed Janusz, Archdeacon of Gniezno, who at this time had been in Avignon with Boryslaw; and Dlugosz says that he was of the Sulima clan, although Damalewicz in Lives of the Gniezno Archbishops says nothing about him at all, inasmuch as in that year Jakob Swinka presided there at that See. The works of Bielski, Damalewicz, Dlugosz, Kromer, Okolski.